The wonderful Lori Anderson is hosting a Bead Soup Blog Party today and you are invited to visit all the blogs participating. Lori personally matched up 362 bead bloggers with a partner. The partners swap a focal, clasp and any other coordinating beads they wanted to send along. We then created something using at least the focal and clasp. The rest was up to us. The last requirement was for all of us to blog about it today. My partner is Karyn Bonfiglio. 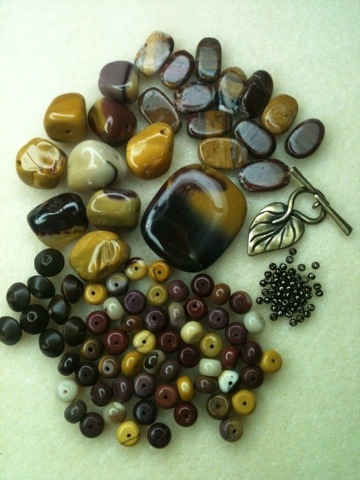 She sent me a wonderful selection of Mookaite stones, some seed beads, wooden beads and a beautiful leaf clasp. The colors in the Mookaite are really something. The natural color ranges from browns and mustard to ivory and a light purple. We were asked to stretch our creativity to try our partner’s style. Karyn and I have very different design styles so this really was a challenge. I’m a seed beader and Karyn uses a lot of gemstones in her work. She really wanted me to combine our styles and come up with something unique. I hope she likes it! You can see I bezeled the focal in seed beads. The necklace can be worn with either side of the pendant to the front. I tried to use the leaf clasp that Karyn sent in the necklace but didn’t want it hiding at the back of the neck. So, I made a companion bracelet with the clasp as the focal. 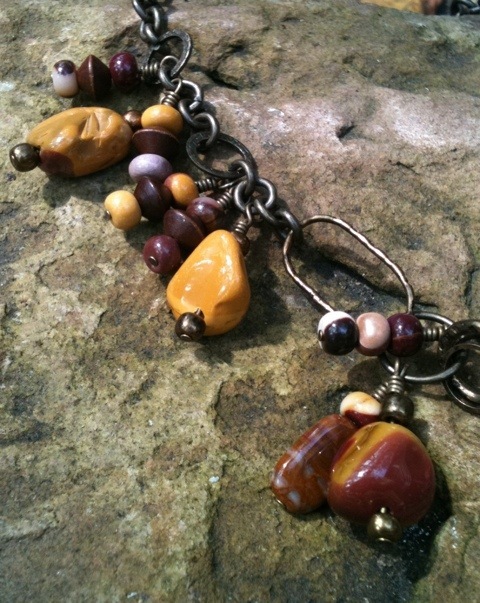 I used the additional small Mookaite beads as charms. I used almost all of the beads that Karyn sent and only added the chain, some wire and a few seed beads from my stash. I can’t wait to see what Karyn did with the Bead Soup I sent to her! This has been such a wonderful experience. I have already made new friends and have been exposed to some great blogs that I now follow. Enjoy! And, pace yourself. There’s no way you can look at all of those blogs in one day! Glad you like it, Cat! I didn’t know Mookaite stone but I think I will soon buy some, it has great colours! I think you did a great work bezeling the focal with seed beads and made the right choice using the clasp for the bracelet. I really love both pieces. This was the first I had heard of Mookaite, too. I’m glad you liked my projects. Thanks for taking the time to comment. 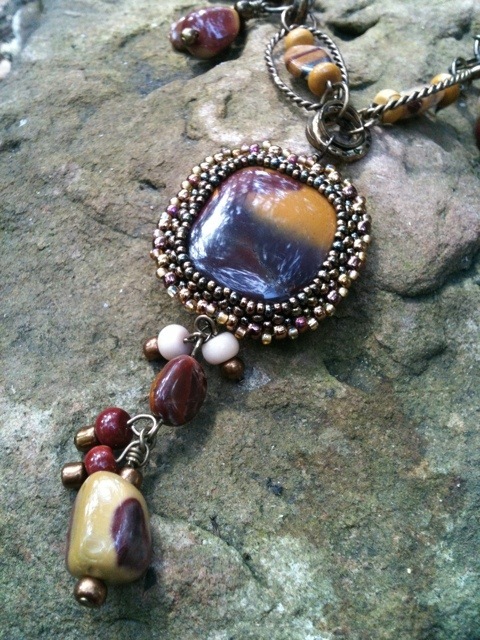 Your seed bead bezel did fantastic things to that stone. Beautiful. Really beautiful…I love what you did with the focal….I love the look of seed bead bezels. The bracelet accompanies the necklace perfectly. That is just amazing! You took a soup and made a masterpiece! Beautiful job- I love it all! Thank you, Erin. It helps when you get great soup ingredients! these beads are great! what a beautiful necklace you made! love it! I love how you made your soup look so elegant and stylish. Your colors and design are gorgeous! Love your focal!! It was a fun soup to work with. Thank you. Oh, I knew when I saw your screen name that I’d found a kindred spirit who like to play with the seed beads — and what a lovely job you did of combining the bezel with wirework to blend your style and your partner’s. Very pretty! Thank you, Bobbie! Yes, I’m predominantely a seed beader. Feel free to follow my blog to see what I’m up to. Fantastic Soup mix you were sent. These pieces are amazing. And the colors are so perfect for fall in a not so typical way. and what you did with that focal. Wow! Soup-er job! Thanks, Theresa. I like using chain for dangle type necklaces. It sure is faster than seed beads! Gorgeous, gorgeous, gorgeous! I love both! So beautiful, the bezel is perfection and I love that you can flip it! And that bracelet is just wonderful! Thank you, Jennifer. 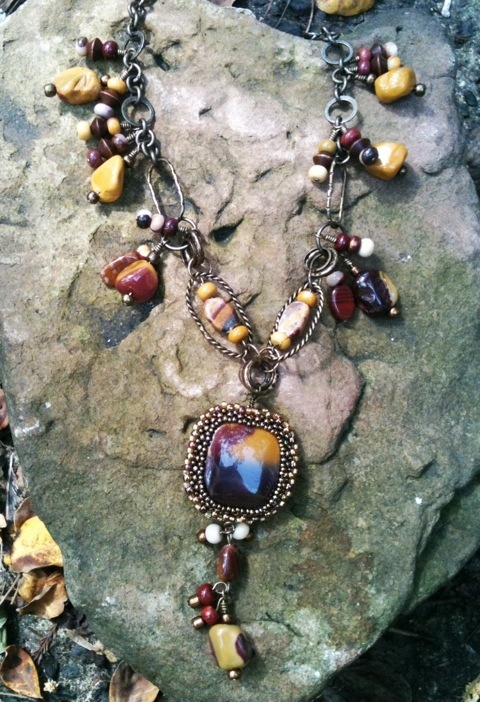 I love to make jewelry that is able to be worn more than one way. and so nice to see all your beadweaving!!! love love love the wire wrapping! your necklace is truly a work of art, enjoy it! Thank you for your kind comments, Gail. love how you did the focal..and for a seed beader you did an awesome job on the rest of the necklace..love it all…your wire work is great. ( I KNOW I could not do any seed-bead work!) love the mooakite and the colour combination. I think you did a great job stepping outside your comfort zone! The seed bead bezel looks great, too, so there’s still a touch of your aesthetic in there. Thank you, KJ. It was a little nerve wracking but a successful try. Wow! You artists that weave the seed beads like that never cease to amaze me. I can barely pick them up! I really like that you wove them around the pendant and created what looks to me like an amulet. It almost looks like an old piece. Love it! Thank you for commenting. I’m glad you like it! P.S. You’ve inspired me to teach myself how to make seed bead bezels for a couple of cabs I’ve been collecting! Thank you for the kind words, Molly. Let me know if I can help you in your quest to learn to bezel with seed beads. The seed bead bezel for the focal is wonderful. It really makes the focal pop. I like all the texture and the dangles in both the necklace and bracelet. Wonderful colors together. Thank you, Kay. I like texture, too. I love those stones and your work is magnificent. I’ll wear them. It seems you were great partners and artists. Love how the bezel brought out the colors in the focal. Beautiful work! As a fellow seed beader, I had fun reading your archives. I’ve been following Bead Line Studio’s updates on the Urban Stripes group. So nice to meet one and read about your journey. Thank you for spending some time with my posts, Karin! Urban Stripes was a great project. I made a lot of new friends and learned so much from the group. Wonderful! You have created two terrific pieces of wearable art. I like the colors of your ingredients and the texture you have added. Thank you for sharing your artistic process along the way. Cheers! Thank you, Lori! This was the first time I have ever participated in any kind of challenge or swap. I was petrified. But, I’m happy with what I ended up making. It helps that I had a great partner for the swap. Yep, you definitely got the wire wrapping part a lot better than I did! Love that bezel, is it just peyote around the sides? I haven’t quite mastered bezeling yet, yours looks awesome. All those dangles are just perfect, and the colors are rich and luxurious. You did a great job on these pieces! The bezel starts with right angle weave and then you use peyote in smaller seed beads to pull it in and capture the focal. I didn’t want to cover up the focal too much, so I did the minimum beads that I thought was safe to hold the focal. Beautiful pieces, I love the beaded cab focal. A lovely necklace and bracelet, the seed beading is great and you wire work is so neat! OH I love Mooikite and I love how you combined the seed beads and chain. Very nice!! Thank you, Marge. I tried to make most of the necklace and bracelet in the style of my partner. Then I threw in a few seed beads for me! Very pretty! I am always amazed by anyone who can work with seed beads as I lack the patience, lol! Great job! Wendy, it does take some patience to work with seed beads. Also, good light and good vision. Thank you for your comments. I love chunky designs and always love to see what others do with such great soup pieces. I love chunky designs, too. I just don’t usually make them. Those are usually the ones I buy from other artists. Dangles! I love dangles, and I love all your wirework – and nice beaded bezel! Great job! Both pieces turned out great! I love the weaving around the focal too. Lovely jewellery! I like how you mixed the different bead shapes and the beaded bezels frame that focal bead so nice. Fab work! A really nice collection of colors to work with…and a great job of combining your partner’s style with your own! I love how you combined the hardware with the stones. Beautiful! Thank you! I had fun picking out chain to go with this. I love how you bezeled the Mooakite. Everything is great! When I first saw your stash I thought, OMG… I wouldn’t know what to do with these! Your necklace is amazing! So creative….. you inspired me! Such rich, beautiful tones! 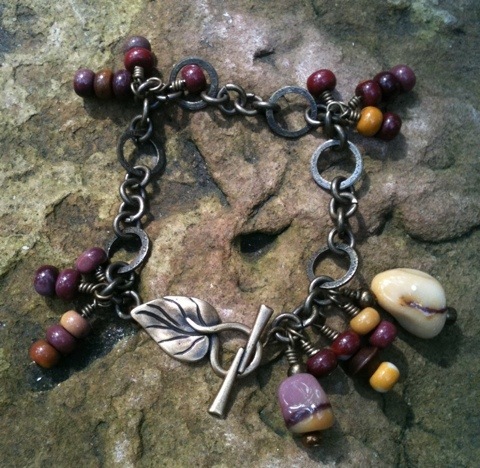 Love your necklace and bracelet, they are perfect for autumn. Thank you, Maggie. The tones are great for the fall. I’m sure it will get worn a lot in the next few months. You did SUCH a good job! I love the pendant bezel, and you did a good job choosing to put the toggle with the bracelet. I hope you’ll join me again! The new badge and dates will be on my blog tomorrow, Sept 19! Thank you so much, Lori! Both for the kind comments and for organizing this gargantuan bead swap. I really love your use of seeds in the focal it really made it pop! You did a great job adding just the right colors to break up a very nuetral palette. Also, the beaded bezel on the focal really sets it off. Oh my, awesome work…love that beaded cab! Beautiful! wow, I can’t believe that you normally work with seeds and bead weaving. This totally like a work of someone who deals with beaded jewellery exclusively. And your wire wrapping is just awesome! Gorgeous necklace and bracelet. The focal you created is absolutely beautiful! Perfect for the autumn season! you did a beautiful job and I love the clasp! You made the focal bead really pop! I love how you bezeled the focal. It looks gorgeous framed like that. You really did this bead soup proud! That’s really cool. I like your combination of different working styles. I could not have imagined turning what you received into those two pieces. They are fantastic! There’s so much texture and so many details, it’s really very cool. Excellent! 🙂 I love that piece of yours. We were told to give good stuff. So, I did! Glad you liked what I did with my soup. You really did stretch your style 🙂 It is amazing and so appropriate for this part of the country. Love this! You did a great job with your soup – these are really cool! It is beautiful. It reminds me of the transition from summer into fall. The way you showcased these stones is just lovely. Beautiful job. Your necklace turned out so amazing! The bracelet, too. I definitely adore how you used the seed beads around the focal point. Great work! Great Reveal! We’re all being pushed outside our comfort zones — with amazing results! Great color you got to work with! love your design – the chain and the drops – just so pretty! My first thought when I saw the soup was “i would have struggled with these”, then I saw your piece and thought…”OOOH, thats what you can do with them!” You made a really beautiful piece!! You were a great bead swap partner. I was challenged and pushed to try another style. I love what you do and am happy that you liked what I did with your bead soup.